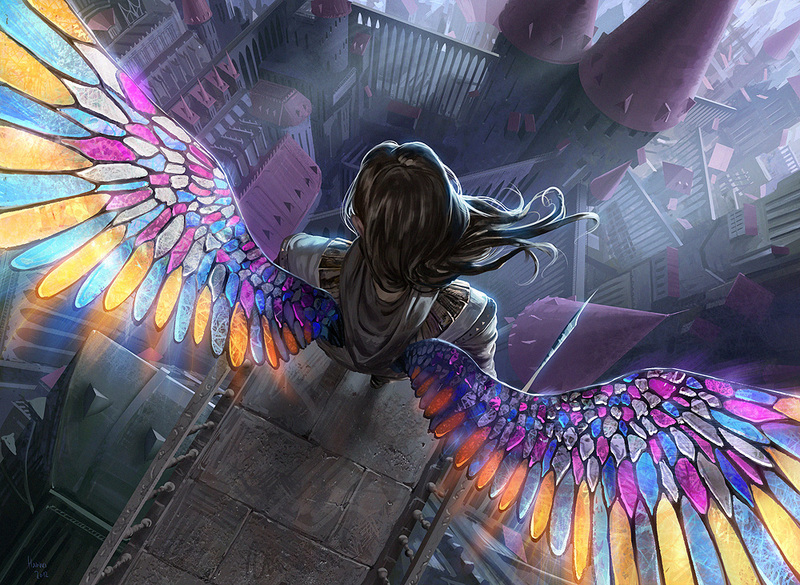 Arcun: Short for "archetype uncommon". A multicolored (usually two-colored) uncommon card designed to signal and support a specific deck archetype in Limited. Ah, should probably have defined better. "Arcun" = "archetype uncommon" (coined by shiftyhomunculus), which synergizes (supports/pays off/etc) a specific color group's draft strategy, or archetype. Examples from Kaladesh. Cloudblazer is a payoff for WU flicker, Empyreal Voyager is support for GU energy, and Unlicensed Disintigration, which having less direct synergy, is an excellent tool for BR aggro. When Rhox Chantleader enters the battlefield, create a 1/1 white Cleric creature token with exalted. "The grace of the ashura is a privilege we must earn with faith." Creatures you control that have Haste get +1/+0 and have Trample. He might not get there first, but he'll make sure you do. As long as you control exactly one other creature that shares a color with Partner in Crime, Partner in Crime gets +2/+0 and has trample. At the beginning of combat on your turn, target creature you control gets +2/+2 until end of turn. Overwatch – If a creature entered the battlefield this turn, that creature instead gets +4/+4 and trample until end of turn. Going to close this in ~35 hours. for the souls of many more depend on it." Not entirely sure this needed to be Bant, the abilities and flavor fit perfectly well in W alone. 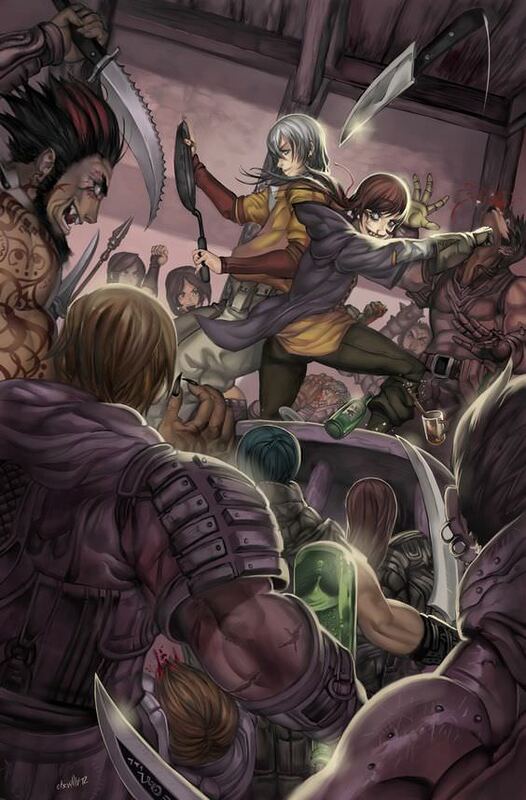 I can see WU, but G is very much a stretch. While no defender means you can beat in with it, 5cmc is quite high- I’d try 3. The ability at 3 is probably a good choice (although 2W is a better fit). I like the versatility of the activated ability, since it’s most useful for blocking (as you get two blockers), pretty useful for attacking, and even has a niche use against burn. 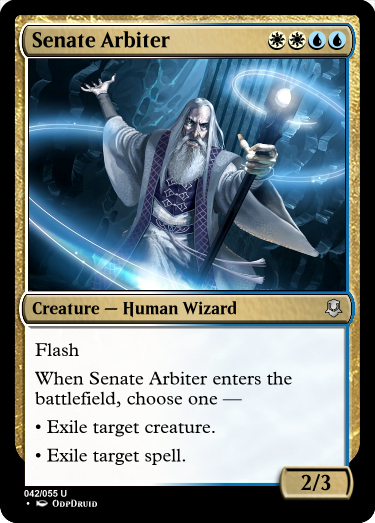 The statline feels quite above-rate for something that dodges removal- I’d put it at a 3/3, or at most a 4/3. 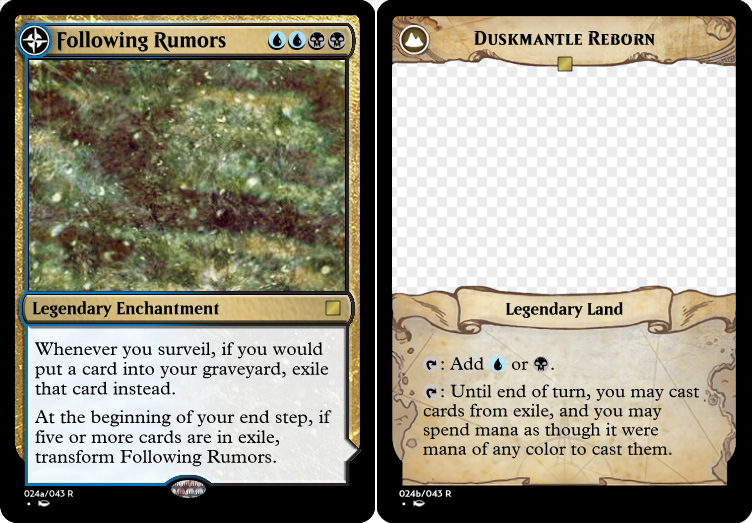 Also not a big fan of the trigger occurring on not only exile removal but also tuck/bounce. 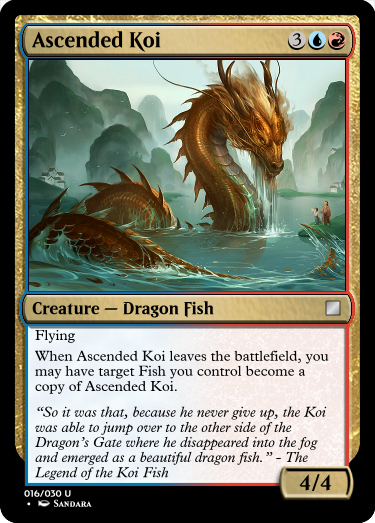 I like the overall flavor, especially since it justifies the presence of other Fish in the set- something necessary to make the card useful at a limited level (gatecrash was the only one in recent memory to have more than one due to Simic shenanigans). The top end on this is certainly high, as this provides an immediate two points of power if you landed a two drop while also being able to swing in as a 4/5 by itself. The token being a separate body is quite relevant as well. This would be less swingy either at four mana (and maybe 3/3) or dropping the exalted from the Rhino body. Haste tribal, eh? In limited this will have few targets at common- often only one- making this very rarely worth the deck slot. This as an aggro topper in constructed could be interesting but also drastically restricts your deckbuilding. I do like the interaction with group pumps even if it is less intuitive with the flavor. My first thought upon seeing this was how it would throw creatures- imo adding an ability to grant another creature haste would heighten the flavor and make it more useful in limited. Interesting for limited (likely too fragile/slow for constructed). Fulfilling the condition doesn’t leave you with much in terms of blockers, but the high stats pushes you towards aggro anyway. The challenge for a X/2 is making sure it results in something useful when it swings in, and menace and trample means not only can it kill small fries but push through a bit of damage as well. The payoff of a 5/2 is quite potent with that ability set- perhaps a bit too potent. A 2/2 that ends up as a 4/2 might be a better spot. This isn’t a creature and is thus invalid- sorry! If I had realized earlier than while I’m typing this judging I would have posted in the thread about it. Comments anyway: Took me a second to process when this would actually be cast. The power level is pretty low, seeing as you have to hold mana up, it’s telegraphed, a condition has to be fulfilled to get the full effect, and it’s a multicolored card in a space where Titanic Growth and Larger Than Life exist. Overwatch is a neat mechanic but I don’t think this effect is a good fit for it. Thanks monger! This is the first time I’ve won one of these contests, so this is very exciting. Next challenge: Design a card with MMNN in its cost. That is, it has at least two symbols each of two different colors. 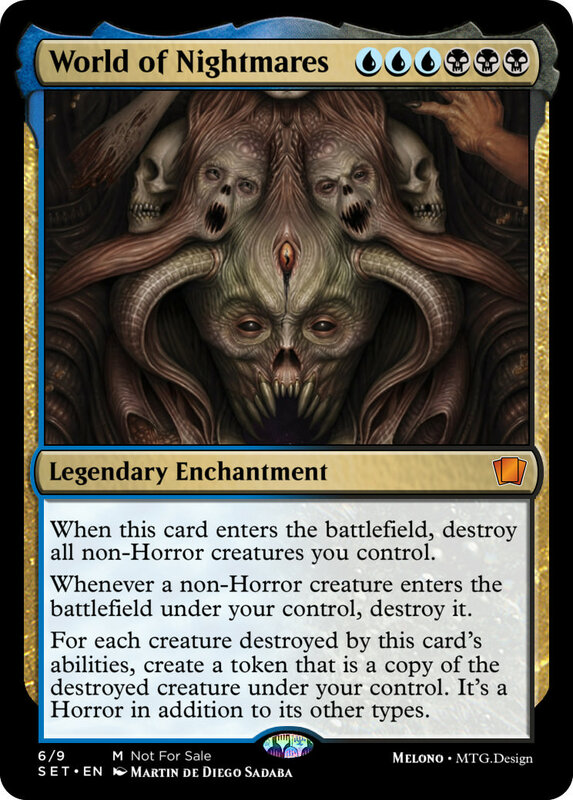 It can be just that, like Jarad, Golgari Lich Lord, or have more colors and/or symbols, like Cruel Ultimatum or Progenitus. When are these usually judged? Thanks monger ! This is the first time I’ve won one of these contests, so this is very exciting. I think most people give it a week, but sometimes it takes longer because life interferes or w/e. long as you control another red creature. Acuindra deal 2 damage to target creature. Judging in a day or two. Get in your last-minute entries. Is this how the spoilers work? When CARDNAME enters the battlefield, exile up to two target nonland permanents until CARDNAME leaves the battlefield. CARDNAME gets +3/+3 for each permanent you own exiled with it. Acuindra seems quite powerful. If you have the red creature, it’s often 4 mana to hit for 4 and kill a creature, and even without the first strike it still hits hard. Uncommon seems right, and I don’t want to play against two of these at once. I don’t get why it specifically checks for red creatures, but overall it’s a great design. Menace on a Ball Lightning variant is very interesting, and Unearthing this late-game can win you the game out of nowhere. Technically mono-red can do all these parts (at least in a setting like Grixis), but as a whole the is necessary. Nicely done. Very interesting design, but I think it’s too powerful. Instead of surveilling as you intended, people will use cards like Arc Slogger, Cadaverous Bloom, Demonic Consultation, or Crook of Condemnation to generate massive value with Duskmantle Reborn. There’s a reason why anything that’s exiled is permanently gone. This ability doesn’t have to be modal. You can just say “exile target spell or creature”. I’m not sure if White is supposed to exile creatures (permanently) for 4, but I’ll allow it since it’s hard to cast. It reminds me of Venser, Dhaper Savant. Very clean design. This is a major blowout. 6 mana for a 9/9 with trample, that removes 2 permanents, at instant speed, is a bit much. Even if it gets killed right away, it’s still just trading for a card, and it’s absolutely absurd when it doesn’t. So I goofed last round of Golden Game and accidentally made an enchantment that cared about things entering the battlefield instead of a creature. Let's make something worthwhile out of that - Your next challenge is to make a multicolored enchantment that cares about things being cast or entering the battlefield! 3/3 for with flash, vigilance and trample that does the banisher priest effect twice. 6/6 for with flash, vigilance and trample that exiles a nonland permanent for each player. Although I think I went overboard with the keywords in hindsight, just wanted to clear up the wording as it seems like that wasn't clear. Whoops! I did overlook that. Your card is a lot more interesting than I gave it credit for. Whenever a spell is cast, starting with you, each player may pay 1 life and gain control of that spell. That player may choose new targets for it. Repeat this process until no one pays life. The soul and the mind are more connected than most want to believe. 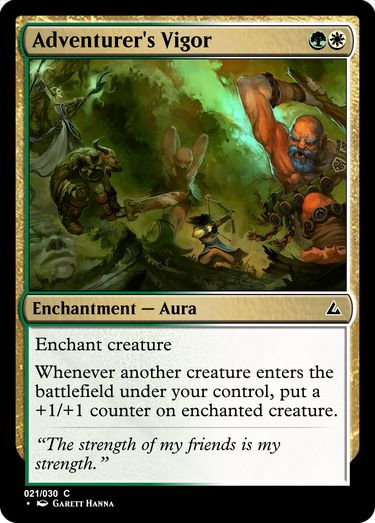 Whenever a nontoken creature enters the battlefield under an opponent's control, sacrifice ~. If you do, gain control of that creature. Pay 1 life: Exile ~. Return it to the battlefield under your control at the beginning of the next end step. When this card enters the battlefield, destroy all non-Horror creatures you control. Whenever a non-Horror creature enters the battlefield under your control, destroy it. For each creature destroyed by this card's abilities, create a token that is a copy of the destroyed creature under your control. It's a Horror in addition to its other types. 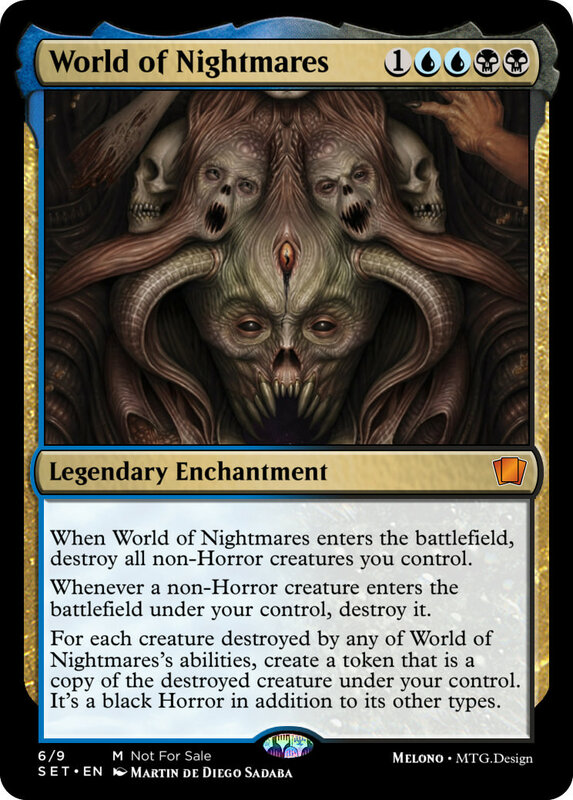 When ~ enters the battlefield, destroy all non-Horror creatures you control. For each creature destroyed by any of ~'s abilities, create a token that is a copy of the destroyed creature under your control. It's a black Horror in addition to its other types. Whenever ~ destroys a creature, create a token that is a copy of that creature. It's a black Horror in addition to its other types. When ~ enters the battlefield, destroy all non-Horror creatures you control, then create tokens that are copies of the creatures destroyed this way. They're Horrors in addition to their other types. 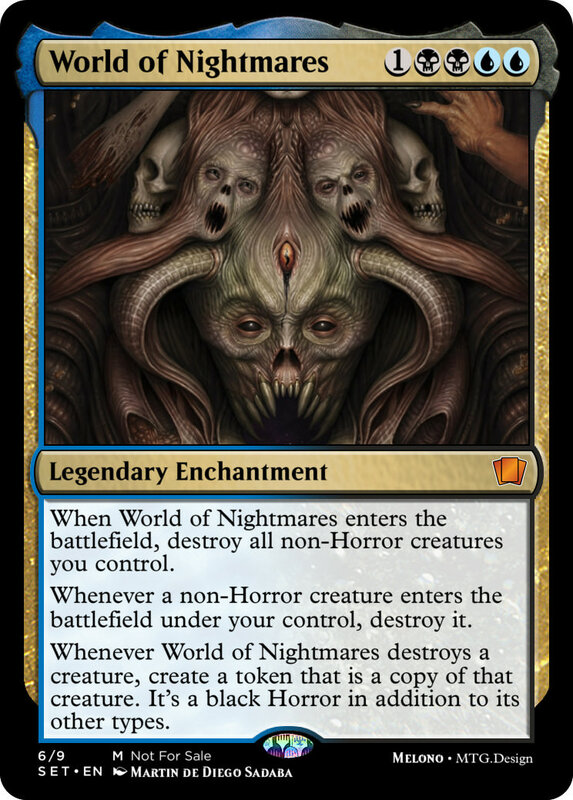 Whenever a non-Horror creature enters the battlefield under your control, destroy it, then create a token that is a copy of that creature. It's a Horror in addition to its other types. for those with a power of 1, cannot attack. counters on it, you win the game. "Wars can be won with words instead of swords." I've been on a horrible mythic streak lately, but, alas, that's where my ideas have been. Whenever a nontoken creature enters the battlefield, you may pay where X is the creature's converted mana cost. If you do, gain control of that creature for as long as you control ~. It has "At the beginning of your upkeep, put a -1/-1 counter on this creature" for as long as you control it. Whenever you cast a spell from your library, untap target permanent. Whenever a permanent enters the battlefield from your library, untap target permanent. Might be a bit too cheap combined with Rampant Growth and friends. Whenever a creature enters the battlefield, you may attach Primal Adaptation to that creature. Judging within the next 48 hours, last call for submissions/edits?